If she is sent to prison, what will become of her children? And Mickey Adams – I wonder what became of him. Within weeks, her blog went viral. 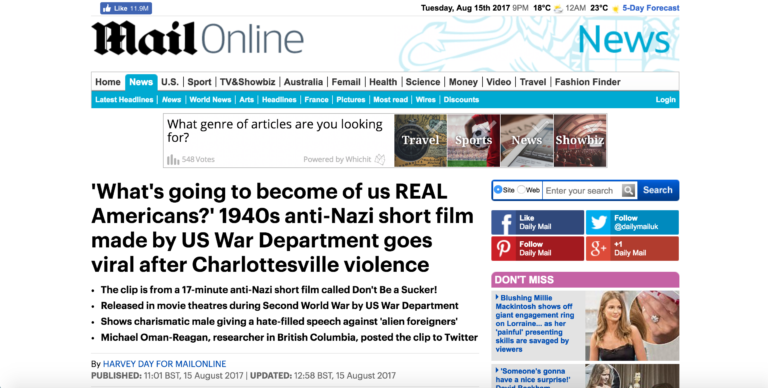 ・The clip is from a 17-minute anti-Nazi short film called Don’t Be a Sucker! A 1940s anti-Nazi propaganda video warning of the dangers of fascism has re-emerged this week, and struck a familiar chord with viewers following the violent events in Charlottesville, Virginia. Their policy on childcare has struck a responsive chord with women voters. Her speech struck a sympathetic chord among business leaders. The clip from a 17-minute short film called Don’t Be a Sucker!, originally released in movie theatres at the height of the Second World War in 1943. August is the height of the tourist season. At the height of the violence/crisis we were left without any help. She was at the height of her career when he first met her. Created by the United States’ War Department and re-issued again in 1947, it shows a charismatic white male giving a hate-filled speech against ‘alien foreigners’ in the middle of a town square. As spectators look on, the man refers to himself as an ‘American American,’ before shouting: ‘I see negroes holding down jobs that belong to me and you. What the party needs is a more charismatic leader. The final game attracted a crowd of over 50,000 spectators. They won 4–0 in front of over 40,000 cheering spectators. No, I don’t want to play – I’d rather look on. Even as a boy he referred to his father as Steve. ‘And I tell you friends, we’ll never be able to call this country our own, until it’s a country without. Without what? Without negroes, without alien foreigners, without Catholics, without freemasons. Michael Oman-Reagan, an anthropologist and researcher in British Columbia, posted the clip to Twitter on Saturday evening. The build-up of troops in the region makes war seem more likely. The ‘greenhouse effect’ is caused by the build-up of carbon dioxide in the atmosphere. The march was met with counter-protests and violence quickly broke out, with one member of the white supremacist group, James Alex Fields Jr, allegedly driving his car into a crowd of anti-racism protestors, killing 32-year-old Heather Heyer. President Donald Trump has drawn criticism after he initially failed to explicitly condone the violence carried out by the white nationalists, many of whom chanted songs such as ‘blood and soil’ during the march. The second incident allegedly occurred in the spring of 1992. The new exhibition has been drawing a lot of criticism. Her speech last night in the Senate drew an angry response. I told you quite explicitly (= clearly) to be home by midnight. The violence is never explicitly shown. The school does not condone bullying of any kind. If the government is seen to condone violence, the bloodshed will never stop. Our soldiers carried out a successful attack last night. Don’t blame me, I’m only carrying out my orders/instructions. According to witnesses, the robbery was carried out by two teenage boys. Senator Orin Hatch also drew parallels between the events in Charlottesville and the fight against Nazism. It would be easy to draw (= make) a parallel between the city’s history and that of its theatres. A number of books at that time tried to draw parallels between brains and computers. I could not allow this statement to go unchallenged. We can’t allow her comments to go unchallenged.